The Charlotte Comicon on December 19, 2010 in Charlotte, NC. More to come. Hope to see you at the cons. The print edition of the Yin Yang graphic novel will be in stores and comic shops in September, 2010. More as I get it from Arcana. We just learned this morning that our graphic novel, DAUGHTER OF DRACULA, has won the Wild Wolf Entertainment Award for best selling WWE title of 2009. WEE's President, Sean Collins, posted the news on a You-Tube clip you can view by hitting title over the column. Rob Davis and I are thrilled by this award and want to thank Sean and Wild Wolf Entertainment for their continued support and faith in the book. They truly helped bring it to a larger audience. And of course thanks to all of you who bought a copy and spread the word. We owe you much. Finally, the book is still available at Amazon and other fine booksellers. Thanks again, Ron Fortier. SHERLOCK HOLMES – CONSULTING DETECTIVE Vol. Two. THE GREAT DETECTIVE IS BOX-OFFICE GOLD! Following the overwhelming success of Sherlock Holmes-Consulting Detective Vol.One, Airship 27 Productions and Cornerstone Book Publishers are thrilled to offer mystery fans this brand new anthology of mystery adventures. Once again, Holmes and Watson challenge the criminal forces that threaten Victorian England at every turn. Arriving in the midst of the media phenomenon that is the new record breaking movie, “Sherlock Holmes”, starring Robert Downey Jr. and Jude Law, this new collection is the perfect treasure for movie-goers eager to get their hands on more Holmes and Watson adventures. As this iconic character’s exploits again take hold of the public’s imagination, new and old fans alike will be pleased to find this volume of all new stories. A twisted scientist plots to alter the course of human evolution while another dreams of creating the world’s first mechanical thinking machine. A body is found in a secured bank vault and modern day pirates have begun harassing Her Majesty’s Royal Navy. Here are five new mysteries that will test the Great Detective’s uncanny talents of observation and the courage of his loyal companion. Writers Bernadette Johnson, Joshua Reynolds, I.A. Watson and Andrew Salmon have delivered another compilation of fast paced, old fashioned tales guaranteed to warm the blood of the most ardent Holmes enthusiast. Sit back, dim the lights, and prepare yourself for the chase. Once more, the game is afoot! This new volume features a stunning cover by artist Ingrid Hardy and black and white interior illustrations by the book’s designer, artist Rob Davis. Edited by Airship 27 Productions’ Managing Editor, Ron Fortier. 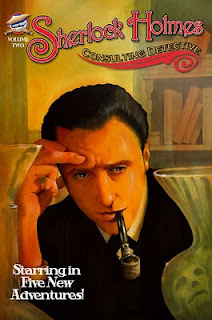 Sherlock Holmes – Consulting Detective Vol.Two is another quality addition to the company’s list of action/adventure pulp titles. Airship 27Productions; Pulp Fiction for a New Generation! Who Are Your Mentors? Read about a few of mine in the latest installment of http://comicsmentor.com.